A family of four from Saratov Region, Russia was reportedly detained by Turkish authorities after they allegedly tried to illegally cross into Syria. Family members, who claim the suspects had been radicalized, raised the alarm. Svetlana Ukhanova and her partner, Evgeny Kochaari, who have two children with them, have been placed in an immigration detention facility in Antakya in southern Turkey, near the Syrian border, the woman's former in-laws claim. Her ex-husband, Sergey Ukhanov, is currently in Antakya, trying to free at least one of the children, his and Svetlana's daughter. Relatives of the other child, who is said to be the one-year-old daughter of Svetlana and her partner, also arrived in Turkey to try and take the little girl, the head of child protection services in Saratov Region, Nadezhda Solovyova, told RIA Novosti. Sergey claims his ex-wife and her partner were accused of attempting to join a radical group in Syria. The information is being checked by the Russian Embassy in Turkey, which has asked to deport the family to Russia if confirmed, TASS reported citing a spokesman for the diplomatic mission. According to Svetlana's former in-laws, their relationship ended after the woman became a Muslim several years ago. "It wasn't just regular Islam, like many in our region practice, but it seemed more hard-line. They stopped watching TV, using computers, and didn't take the child to the kindergarten any more, saying she shouldn't be communicating with other kids," Svetlana's former father-in-law, Valery Ukhanov, told RT Russian. The man, who is very worried about his granddaughter, said the girl was often crying when visiting her grandparents, and didn't want to return to her mother and new family. 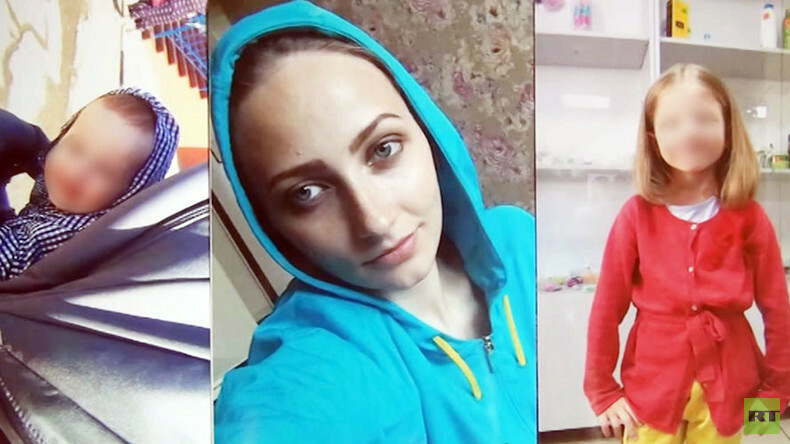 "Svetlana herself started wearing hijab all the time, and she also always put some horrible black headscarves on her daughter. Many Muslims live in our neighborhood, but I've never seen little Muslim girls wearing black headscarves," Valery said. He also claimed that Svetlana and her partner changed their profile pictures on social media to images of armed people. Last month, the woman took the children to Turkey "under false pretenses," the Ukhanovs say. She allegedly claimed she was taking the kids for a vacation by the sea in Ankara, but then disappeared. Sergey, worried about his daughter, launched the search. The man managed to find out that his ex-wife had purchased tickets to travel from Turkey to Azerbaijan, after a reportedly failed attempt to cross the Turkey-Syria border. He booked the same flight with Svetlana's mother, and met the suspected runaways at an Istanbul airport. However, when they attempted to confront Svetlana, the woman refused to return home or give the crying girl back to her father. Turkish police then reportedly intervened, detaining the woman with the children and her partner. They have all reportedly been moved to the Antakya detention facility. Back in Saratov Region, the girl's grandfather, Valery Ukhanov, seized the opportunity to publicly address local authorities and the media on the matter this week. The family then said higher authorities promised to deal with the case, with FSB (Russia's Federal Security Service) officials already contacting them.